Question: Recently, I’ve been visiting at the hospital frequently and I notice that some patients lack a basic drive for life. People do not cling to life. What has happened to this basic desire? Answer: It disappears in sick people, and the elderly, and the young. This is the natural course of evolution: The egoistic desire is growing, not only quantitatively, but also qualitatively. We still judge by quantity; we strive to a greater scale, greater luxury, but in the meantime, the quality changes. And suddenly we discover that development requires something higher, values that do not exist in our world. There are new requests in me, and my environment cannot give me answers to them. It turns out that I have nothing to do here, there is nothing to look for, nothing to live for, nothing to enjoy because I do not just seek pleasure, but want to discover something more essential. But wait, what essence is there? People themselves do not know what they want. People whose mind and feelings have not been yet developed enough become economists, lawyers; in short, they look for success in life. They are still attracted by something, enticed by some benefit. But those who have evolved a bit more can no longer find anything worthwhile for themselves. They initially have no taste for life, and this produces much more serious phenomena than we see on the surface. After all, the media and Internet save many people from suicide. The general opinion makes everyone participate in these “games,” distractions from the main question. But soon, this will end; in six months or a year, the wave will subside, and we will see how media resources and virtual reality lose their popularity. Question: It is known that the statistics of depression and emptiness are increasing. Where will people get a new desire that will lead them on the spiritual path? Answer: In fact, it is impossible without the “Light” from above. Of course, we will not be able to awaken them if we do not get the Light for us and for them, according to the principle “the first-born takes double.” Only in this way, will we be able to show them the way, to show them a spark of the Light, which is enough for everyone. In the end, it is our duty. Question: How do we reach collective exertion? Answer: This is all the work in the group. Without a collective effort, without our connection, we cannot attain vessels of bestowal. We don’t have desires to bestow; there are only desires to receive! In the desire to receive, there is a point in the heart. So how can I build a desire to receive from it? I have to be incorporated in the right environment, with the initial bud of bestowal, the point in the heart. I accept this environment as if it is my “point in the heart.” The group is thousands of points in the heart, a billion times bigger than my one point! If there is only one star in my heart, then the environment is like all the stars in the sky. I want to connect them, and by that I build my GE. Otherwise there is nowhere I can get vessels of bestowal. 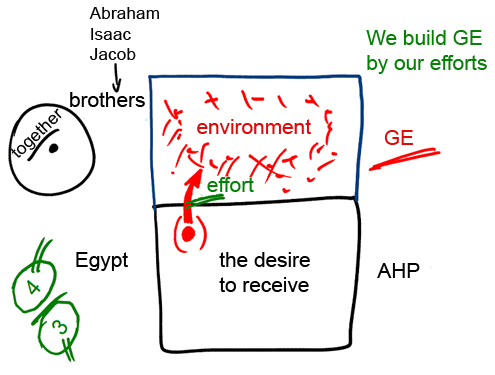 These GE already belong to the next level with regard to my desires to receive (like phases three and four) and are intended to adhere to AHP of the upper. By being incorporated in the environment, I build the desires to bestow (GE), and if I am not incorporated, then they don’t exist in me. Then I can say that my desires to receive are my AHP, and to the same extent I am incorporated in the group. If I have brothers in it (my family: Abraham, Isaac and Jacob), with whom I am in a conflict now, then to the same extent I am in Egypt. My whole path is determined by how I am incorporated in the group: First it is Babylon, then the Land of Canaan with all the adventures there, until I find myself in Egypt, right in it. This whole inclination takes place in the group, together with everyone else. “Brothers go down to Egypt,” means that the desire to receive that separates them grows and they turn it to in order to bestow, which means that the children of Israel multiply in Egypt. During the first seven years, their number grows, and then come the seven years of famine, which is the time to start the correction. They carry on in the same direction, but now they see that Egypt enslaves them and doesn’t let them attain a higher level. This is called that “a new king arose in Egypt.” But in fact, the same work in the group continues and as a result the states that are described in the Torah are revealed. This whole story is fulfilled only in a person’s connection to the group. It is in the connection that everything the Torah tells us about is revealed. The Torah tells us only about a person’s connection with the Creator in order to bring Him contentment. There is not a word in it about anything else. Baal HaSulam, “The Wisdom of Kabbalah and Philosophy“: The reason is that although this love is merely a consequence of the gift, it is still far more important than the gift itself. It is like a great king who gives an unimportant object to a person. Although the gift itself is worthless, the love and the attention of the king make it priceless and precious. Thus, it is completely separated from the matter, being the Light and the gift, in a way that the work and the distinction remain carved in the attainment with only the love itself, while the gift is seemingly forgotten from the heart. Therefore, this aspect of the wisdom is called the “Formative Wisdom of Kabbalah.” Indeed, this part is the most important part of the wisdom. We are talking about the wisdom of Kabbalah with which I clarify and check the Creator’s attitude towards me and accordingly stabilize my attitude towards Him. The King is very cunning: He gives me a gift and arranges everything so that in this gift I will feel His attitude towards me and feel shame as a result, since I don’t feel the same towards Him. He takes care that I will decipher it correctly, that I will “read” the situation and will not erase the shame inside me, but instead, the shame will help me resemble Him. When I receive love from Him, when I feel the gap between His attitude to me and my attitude to Him in my shame, I thank Him, although the shame burns like fire. It is this feeling that helps me build myself. In fact, the shame can turn out to be the right deficiency. If I don’t want to erase it, it is already the right attitude, and now above this deficiency, I have to build my attitude towards the Creator. This means that the shame mustn’t disappear. On the contrary, it should grow, and I should try not to extinguish it, not to cover it, not to cover it up, but rather to turn it into such love, just as I feel it from the Creator and even more than that. Why is it more? Because love is taken for granted by my ego. Everyone needs to love me. If I receive a gift of $20, I will forget about it after a short while. But if someone takes $20 from me, I will resent it, as if I had lost $200,000. This is the egoistic approach: I always deserve the gift and the harm is unacceptable. If someone says something good about me, I am satisfied until I forget about it. But if someone says something bad about me, I will not calm down until I repay him. So feeling shame before the Creator doubles the love and helps me build a vessel of bestowal that matches my ego. Otherwise, I will see that only receiving gifts of love from Him is not enough for my ego. I simply must have the shame, the force that doubles the force of love, by allowing me to develop a greater deficiency for bestowal and to fulfill it. Question: What will make me love the other? Why should I love him? Answer: First, we are not speaking about love for someone close to you, not about your beloved, but rather about someone who is totally “neutral” towards you to begin with. Then we begin to connect because of a common spiritual goal that cannot be attained without a mutual connection. On the way to reaching the goal, you feel mutual aversion, until it becomes real hatred. You work on this hatred by feeling the “hardening of the heart” each time, by sometimes evoking love and then hating one another again. You experience constant ascents and descents and what is more, you mainly feel aversion and hatred. You are constantly trying to enter the “niche” of indifference that allows you at least to keep the external framework, although it doesn’t lead to anything. This is the worst state, the “dead” state, when the friends don’t decide to get close to one another because they are afraid to discover hatred. But without hate it is impossible to advance towards love, and only the indifference remains. Question: But what forces and motivates me? Answer: You want to attain the goal. This desire forces you and motivates you if you are not deceiving yourself, of course. If you are deceiving yourself, you are simply wasting your time. So do some soul searching: Do you want to attain the goal, which means the Creator, the attribute of bestowal? If you do, then the friends and group have been prepared for you, invest in them. And if you don’t, then go home. We mustn’t give in to routine, and you mustn’t accept the fact that tomorrow and the day after tomorrow will all be just like today. What do you expect? The upper Light is in a state of absolute rest, and it is only by our desires, in our vessels, that we can change reality. Nothing will happen if we don’t act. Israel has no “fortune.” Whoever follows the path of Yashar—El (straight to the Creator) is actually building his own “fortune,” the Light that drips and pours from Above. Opinion (Ernst Ulrich von Weizsäcker, Co-President of the Club of Rome, Germany): “Every doctor knows that a prerequisite to successful treatment is the correct diagnosis. And here it is: humanity prefers to shut its eyes and think that as long as the climate does not change dramatically, we can do nothing. If humankind continues to talk this way, the world will be nearing its end. “Unfortunately, for many people, short-term success is more important than the fate of their own grandchildren. Therefore, they all chase scary thoughts away. My Comment: If you establish a correct diagnosis, then it is not in our attitude towards the planet, but in ourselves, in our egoism, and treating the cause is the correct solution and cure. This means re-educating people, and this cannot be ignored; otherwise we will not achieve a positive result, and the disease will worsen as for all the years of the existence of the Club of Rome. Food: Reserves Are Depleted, Are Riots Expected? In the News (from Express): “Shop food prices in the UK have risen on average by 37.9 per cent in seven years according to the Office for National Statistics as the demands of an increasingly affluent and growing world population strain supply and as weather increasingly deviates from traditional patterns. “And the situation for billions of consumers around the world can only get worse. The average price of staple foods is expected to double during the next 20 years due to price spikes following extreme weather events such as this summer’s drought in America which destroyed one sixth of its corn crop. “We are facing nothing less than the onset of a global food war leading inexorably to riots, geopolitical tensions and global inflation as well as increasing hunger. According to a study published yesterday, pressure on the world’s resources is becoming so great that the situation could trigger warfare. “With demand for basic commodities such as wheat set to soar during the next two decades, relatively small shocks to supply risk causing sudden price rises and triggering ‘overreactions or even militarised responses’ according to a report by the Chatham House think tank. My Comment: There is plenty of food in the world; the problem is in its even distribution! But it is necessary to change people for this. That is, re-education is necessary. How Are the Press and the Internet Faring During the Crisis? Question: How can I check whether I am worthy of participating in the Arava convention? Answer: We don’t aspire for making this a mass convention, but rather a qualitative one. This convention is open to anyone who wants to come, and we don’t want to check anyone and ask for references. We are waiting in this convention for all our friends from all over the world who are really willing to annul themselves before the society. This is the only condition! A person should make this inner calculation personally. No one knows what happens inside a person, but he has to make an honest soul searching. This will be felt according to his participation, according to his readiness and his devotion. We don’t need people who just happen to come and who usually don’t participate in their local conventions. We need people who are dedicated to the goal. It is because in such conventions the quality is more important than the quantity. People shouldn’t come in order to just walk around like observers and to criticize things, or to come for one day instead of three days. Whoever wants to come must be present from the beginning to the end, to dive with his head and heart into the convention. Otherwise, it is not worthwhile coming! This is my warning. Question: In the article “The Peace,” it is said: “The store is open and the shopkeeper sells by deferred payment; the book is open and the hand writes. And all who wish to borrow may come and borrow, and the collectors return regularly, day-by-day, and collect from a person knowingly and unknowingly.” What is the payment? Answer: And what is receiving? What do you get from the store? Do you steal by not knowing what? All your life, all the thoughts, all the feelings, everything that continually passes through you, you get from the store, from the first atom to the very last great attainment. You are created in a certain way, with particular physical, internal, psychological, spiritual, mental properties so that you transform yourself. You got this knowledge and conditions. You are in a place that is involved in transformation. Bring yourself closer to the likeness of the Creator. Thus, you pay for what you receive. Or else, a person does it involuntarily under constant successive blows and suffering. But his suffering pays for nothing. He just comes to the realization that he has to pay; he needs to change himself. This may take another 100 years. You have the opportunity to begin to change yourself now and thus to justify your existence, meaning what you get from the store. Payment is made accordingly with our reasonable actions, aimed at becoming like the Creator, which is the way that I change the world into the likeness of Him. I change not only my attitude to everything, but also education, upbringing, dissemination, the whole world, but first of all, myself.